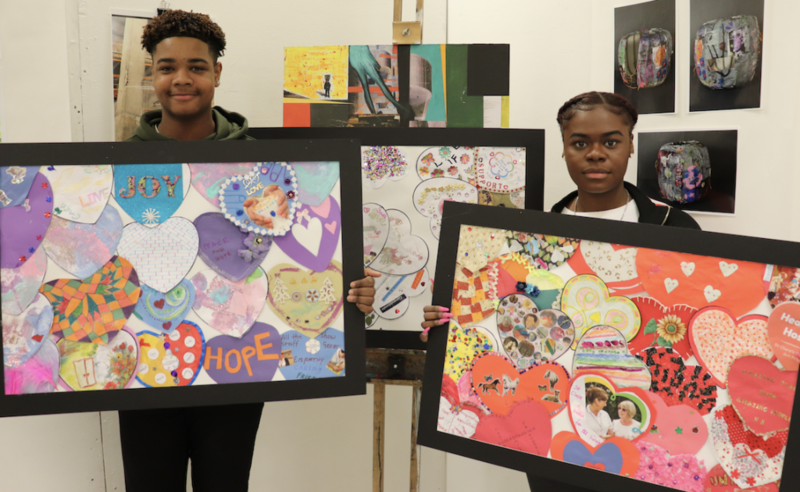 WEST Essex and East Herts charity, St Clare Hospice, has enlisted the support of local students at New City College, Epping Forest, to help put together the fruits of a four-month community art project called ‘Heart your Hospice’. The ‘Heart Your Hospice’ community art project launched in October 2018, as part of St Clare’s campaign for Hospice Care Week (8th-14th Oct) – a nationally celebrated awareness-raising week around hospice care in the UK. Closing on Valentine’s Day (14th February), St Clare collected more than 150 decorated paper hearts from local people in the community throughout the duration of the four-month project. In total, St Clare received more than 150 hearts, comprised of postal entries from local people; from St Clare patients, staff and volunteers; and from groups within the community. “Fortunately, our friends over at the college’s art department were more than happy to help us out – creating three beautiful A1-size collages of all the hearts we collected. This artwork is going to make such a special display here at the Hospice, as each of the 150 hearts was created by a member of the community to represent St Clare,” Sally explains. The Hospice’s strategy for the coming years details an inherent focus on expanding their care and reaching more local people, as well as developing the organisation as ‘a hospice without walls’. “The Heart your Hospice community art project was our way of getting people involved in St Clare, and is a representation of our plans for the year ahead in empowering communities to connect with and support each other, with the helping hands of St Clare,” Sally adds. “When we were approached by the Hospice to see if we could help with their Heart your Hospice project, we were keen to lend a hand,” said Rowan Hartfree-Peace, Senior Curriculum Manager for Creative Industries and Community Education at New City College, Epping Forest. “The Hospice had run a successful community project and asked if we could get involved and come up with some ideas for how to present the artwork as a one piece. I asked some of my students to help, and they decided the hearts would look good as a collage grouped by colour. They sifted through all the designs, picking out reds, purples and whites, and arranged them together,” Rowan explains. “I’m really pleased with the outcome, and we hope that the Hospice is able to display the work somewhere for others to appreciate. It’s a great opportunity for us to work with local community groups such as St Clare and hope this is just the start of a future creative relationship,” Rowan added.